Be a part of Europe’s Earth observation revolution by applying to join experts at one of two Sentinel-3B launch #SocialSpace activities on 25 April. The Copernicus Sentinel-3 mission is a constellation of two satellites and that’s why our SocialSpace event will double up this year: there will be not one, but two SocialSpace events, held simultaneously to follow the launch of Sentinel-3B. One will be at the ILA Berlin Air Show, and the other will be in ESA’s mission control centre in Darmstadt, Germany, the operational heart of ESA and the Sentinel missions. Are you passionate about our planet, about how satellites help us to understand our home planet and about sharing via social media? This time around, you get to choose between two special locations, where ESA will be pleased to host you for an exclusive programme that will include the latest information from experts in Copernicus and ESA Earth observation programmes. You may apply for both events but, if selected, you will be invited to one. Sentinel-3B #SocialSpace in Darmstadt will be held at ESA’s centre and Eumetsat, the European Organisation for the Exploitation of Meteorological Satellites, both within walking distance of the main train station. 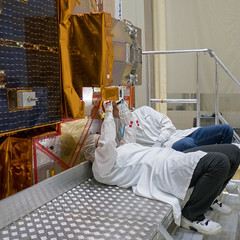 Invitees will have a behind-the-scenes experience of the launch, including an exclusive look at the mission control facilities and meeting some of the people with the science, engineering, applications and businesses expertise behind Copernicus, Europe’s most ambitious Earth observation programme ever. Sentinel-3B #SocialSpace in Berlin will be held in the Space Pavilion of the airshow. It will provide an exclusive space experience including cutting-edge information from science, technology, space exploration and Earth observation. You will be a special guest at the ESA launch event inside the pavilion, joining guests from Copernicus and Eumetsat as well as ESA’s own mission scientists and project managers. The main event will start in the late afternoon, but you’ll have time to visit the airshow during the day. Meet the scientists and engineers who are bringing the Sentinel missions to life. Have previous postings that are respected and accurate. The two events will get under way at mid-day on 25 April, and continue through the day until late in the evening – about 22:00 CEST in Berlin and 23:00 CEST in Darmstadt. Be sure to include your name, social media name(s) and contact information, and – most importantly – a few words describing your motivation or interest in joining. You’ll have to choose which one of the two SocialSpace events you’d like to attend: you can apply to both, but, if selected, you will be invited to only one. Applications may be submitted for one person only and are non-transferable. Please do not submit multiple applications. All applicants must be at least 18 years old on 25 April 2018. WiFi access and catering will be provided. Individual participants are responsible for all other travel, accommodation, meals or miscellaneous expenses. The event will be held in English. Questions can be answered in a variety of languages on an as-available basis. The application deadline is 12:00 CEST on 6 April. Once all applications have been reviewed, an invitation email for one of the SocialSpace activities with confirmation information and additional instructions will be sent to the selected participants and to those on the waiting list, no later than 13 April. We will keep you posted of progress. 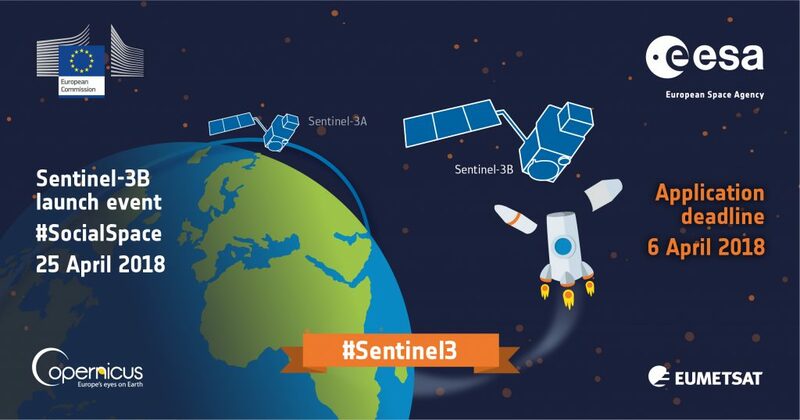 The official hashtag for the mission is #Sentinel3. Send queries to contactsocialspace@gmail.com or tweet to us at @ESA_EO or using the #Sentinel3 hashtag.